Well hello there! Spring is officially here (whether it’s warmer or not) and I’m happy to be sharing an eclectic spring tablescape with you today. You might remember the last tablescape blog hop hosted by Chloe from Celebrate and Decorate and I was really excited she asked us to share again! If you are new here, a special hello. Thanks so much for stopping by! I would love if you would leave me a comment so I can “meet” you! You can find loads of rental friendly DIYs and decorating tips in eclectic global style posted weekly here. 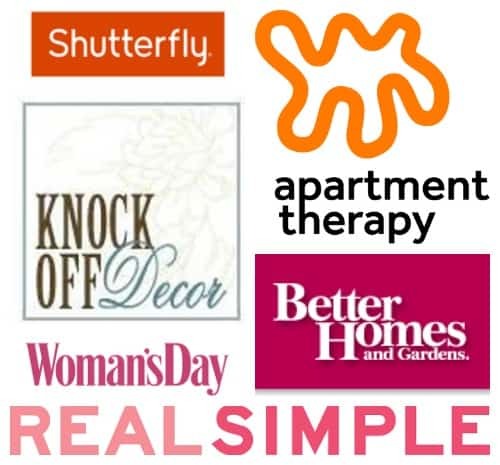 If you are looking for some extra help with decorating, sign up for a free 5 day email course or check out e-design services. I’ve been dreaming about the day I could share a beautiful tablescape in an actual dining room! Our tatami room might not be a traditional space (unless you live in Japan) but we’ve been enjoying having a separate room to spend our meals together. Break up sets and types of plates by mixing colors and patterns. The spring table settings are made up of white IKEA plates with bamboo salad plates (from Japan) and cabbage leaf plates. The trio sits on top of a woven charger and is topped with a faux succulent. Layer your table textiles (runners, tablecloths, and placemats) with globally influenced prints. When we were living in Okinawa I picked up a pretty silk pink table runner which I layered on top of an IKEA white lace curtain panel. Add interest with more than one centerpiece. Wrap flowers in cabbage or other leafy vegetable for a pretty arrangement. Nothing is easier or cheaper than shopping your house for other fun details. You can find faux air plants and succulents all over our rental so adding them to the table was a breeze. The colored Okinawan glass tumblers and thrifted gold bamboo serving ware add more global interest and fun pops of color. Bonus, all the pretty pinks and reds tie into our Wes Anderson inspired bookcase. Strawberries garnished with faux succulents might be a little strange but they sure look pretty! So just by breaking up sets and layering dishes and textiles you have the start to a gorgeous eclectic table! Embellish with plants or other decor from around the house to add global style. Thanks so much for being here today. Make sure to check in every day this week for more tours. You can find the line up below. Gorgeous! Those pink (ranunculus?) blooms are beautiful and I love the cabbage leaves inside the glass vase to add texture and color! Pretty and interesting layers~ I love your use of the white lace curtain panel as a runner on the table. Kathy, what a beautiful and eclectic tablesetting. The textures and layers are so inviting! I love the faux succulents mixed with the strawberries. Happy first day of spring! Kathy, I love your eclectic style. Very soothing spring table! Great to meet you, Kathy. This is a fun blog hop! I like your global style and love your centerpiece of ranunculus wrapped in cabbage leaves. 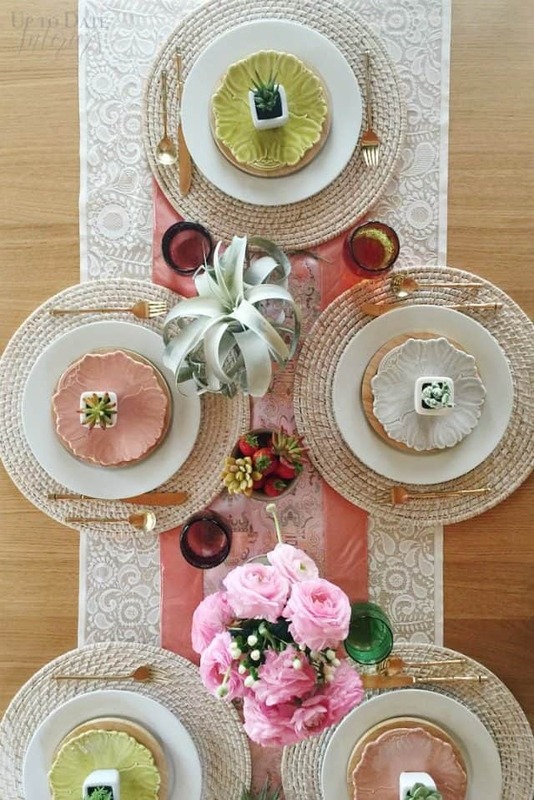 Your layers and textures of dishes and linens and pretty colors make your table fun and inviting. Thanks so much Bonnie! Great to meet you too. Very adorable Kathy! 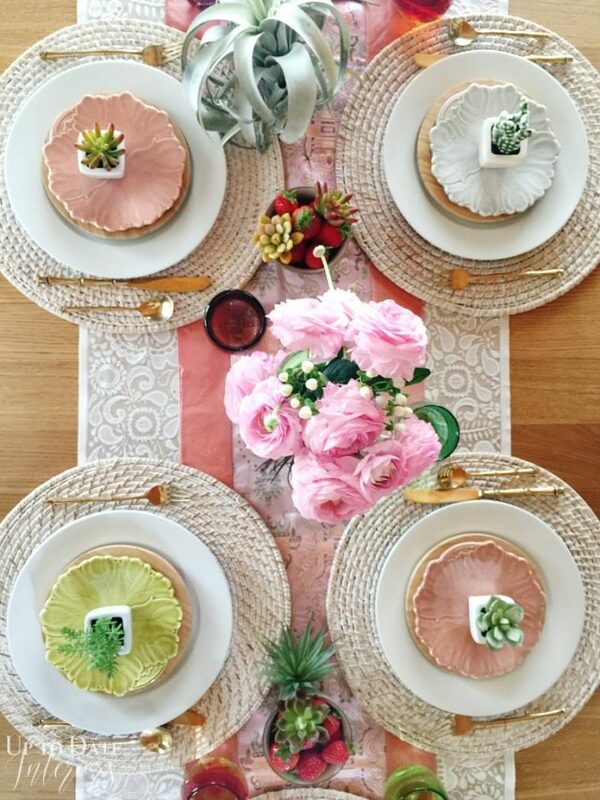 the succulents are so sweet on the pastel plates! I love the freshness of it all, so so pretty! The overhead shots are fabulous! 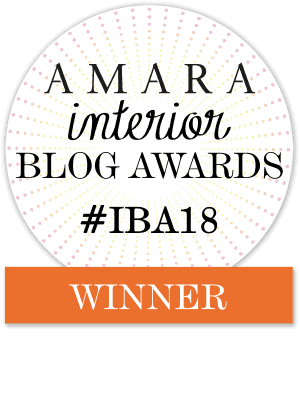 Thank you for sharing in the blog hop, I am liking the glass pitcher with lettuce and peonies arrangement – so unique. Kathy, what a pretty Spring table. I love the touches of pink, and your flowers are gorgeous! Happy first day of Spring!!! Thanks Kim! I’m so excited to go through everyone’s tablescape! WOWZERS. I love it! Just gorgeous. And love your pics. I am learning photography but would love to have pics turn out like this! Your tablescapes are always so fresh and unique and this one is no exception! Thank you so much for joining us again for this blog hop! 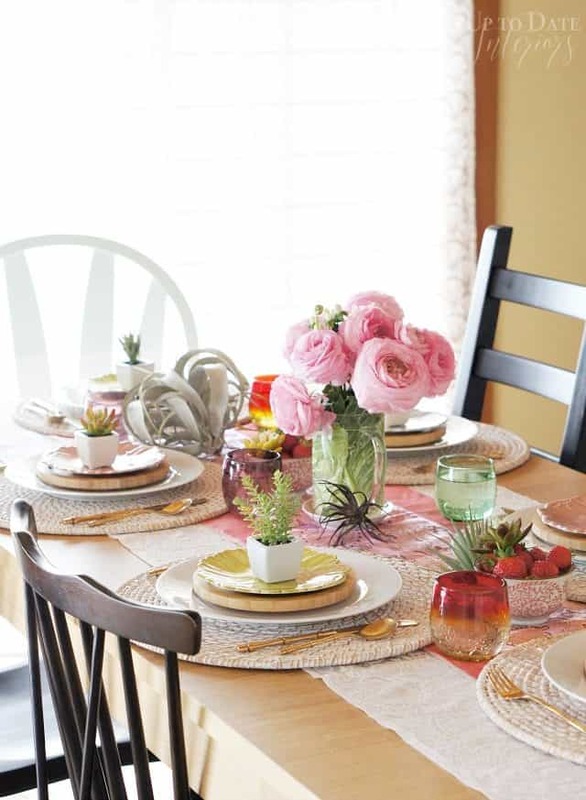 I love your use of the little faux succulents, and those pink roses or are they ranunculus? I don’t think there is a thing strange about using the strawberries and faux succulents together! I am a big big believer in breaking rules when styling a table…actually, what are rules? I enjoy your fun tables and would love to dine at them! Thank you so much Chloe! And thanks for all the time you put into hosting this tablehop and the beautiful graphic and make is so successful! Gorgeous spring tablescape! Those pink flowers are beautiful and I love the cabbage leaves inside the glass vase.Happy first day of Spring! Your table is a breathe of fresh air!! I love the pink! Succulents and peonies look so pretty together-I never would have thought of that. Thanks for the inspiration! Thrilled to be hopping with this talented group! Thank you Linda!! This was really fun. Love those peonies! What a pretty table. Kathy, your peonies are gorgeous and I love the different colored plates and how you layered them. All those pink flowers speak to me. Great to be on the blog hop with you. Your home always look pretty. I like the combination of the succulents and roses. Very unique. Aw! Thanks Maria! Happy to be doing this blog hop with you. Nice to meet you. I am so happy to be here visiting your pretty blog for the fist time. I love your spring table. It is so pretty. I love the blush pink tones. It is clean, fresh and original. The cabbage leaf plates are beautiful as well as the gorgeous pink flowers on your table. The runner ties everything together. Looking forward to the blog hop this week. Nice to meet you Janet! Thanks so much for the sweet words. I really enjoyed putting the table together. Can’t wait for the next blog hop! Your lovely spring tablescape does have international appeal! Love the layering of the items you used to create a table runner and the individual succulents at each place setting are such a nice touch. Your floral centerpiece and the pretty little plates add fantastic colourful elements and look great. Happy Spring! Thanks Lori! I love layering and mixing it up. lol Happy spring to you! I don’t know what the flowers are either but they are FABULOUS and wrapped in the cabbage is a brilliant idea! I love this tablescape! I think what I love most about it is that it is unique and “clean”. I always set my dining room table and kitchen table with fun dishes and placemats, etc. but I haven’t taken the time to really do it fun since New Year’s. This has inspired me. And I wanted to tell you that I am new to your site. I found you on pinterest and fell in love with your site. I love decorating, organizing and decluttering. (Organizing almost to an obsession! hahaha). I work 4 days a week and my husband and I have two grown daughters who are finishing their doctorate and masters in May and next May. So we are empty nesters for all intense purposes and I am using my extra time to write, speak and run our non-profit for children in children’s hospitals. I also use my Fridays off to organize and decorate and just set goals and work towards them for a better organized, cleaner, fun-decorated home! I will use your site and ideas to incorporate and make that happen! Thank you and thank you for asking me to introduce myself. Your style is perfect for me! You must be one proud mama! It is fun to set a pretty table every once and awhile. I love that you have dedicated Fridays to organizing and decorating, would like to hear more about your non profit for children! I’m so happy to have you back! What a table! The photography is beautiful as well. I look forward to seeing more of your blog. Have a great day. Thank you so much Nancy! Happy spring! beautiful spring tablescape Kathy! I love the little succulents and the colours. Your eclectic table is so pretty and the ranunculus/peonies wrapped in a cabbage leaf is gorgeous! I also love how you think out of the box by adding the faux succulents to the strawberries. Beautiful! This is just beautiful! Love the colors, layers and quirkiness!